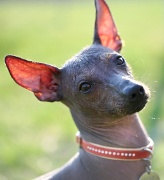 Fans of the phrase “it does what it says on the tin” will appreciate the Mexican Hairless: a dog that originates from Mexico and is almost completely hairless. The official name for the breed is ‘Xoloitzcuintle’ – but just looking at that word, it’s easy to understand why English-speakers came up with an alias. (If you really want to give it a try, Xoloitzcuintle is pronounced show-low-eel-squint-lee). Whilst the hairless appearance can look strange at first, they are actually rather striking dogs. Their tall, pointed ears and dark, almond-shaped eyes give them an almost mythical look; they carry their sleek frames with great elegance and poise. It’s perhaps not surprising that the ancient Aztecs considered them sacred; even today, some Mexican people believe these dogs to have special healing properties. Archaeological records show that the dog has existed in Central America for over 3,000 years, although they were not introduced into Europe until the 16th century, when sailors returning from the New World brought them home on their ships. In hot countries such as Mexico, not having a fur coat might be considered an advantage – but here in the UK, where our climate is just that little bit colder, your beloved Mexican Hairless should be kept indoors. Whilst they do require some washing and grooming, owners should be careful not to over-bathe as this can strip away the skin’s natural protection.